It started last summer when I first asked the Tulsa World newspaper to investigate the franchise company, Beautiful Brands International (BBI), that they had unabashedly been praising for years. While TW business writer Kyle Arnold was eventually persuaded to do a more realistic article on the company in question, a leaked email indicates that Ziva Branstetter, the editor in charge of Tulsa World’s 5-person investigative team, did an aggressive investigation of me, compiling personal, family, and financial information while searching for a hint of a criminal record or other impropriety. Ziva Branstetter then secretly turned over the personal information to the hot-headed and vindictive CEO of the company, David Rutkauskas, who publicly posted the sensitive information as part of an ongoing Twitter campaign intended to humiliate, intimidate and discredit me… and to punish me for daring to speak the truth about his company’s controversial track record. Urban Tulsa Weekly writer Jaime Adame broke the story in an article entitled Stranger than Fiction Silence over Tulsa World editor doing digging for CEO. Writer Holly Wall would also cover the story for This Land Press: New Tulsa World Publisher Faces Troubles in First Week. Here is the complete text of the email Tulsa World editor Ziva Branstetter allegedly sent to BBI CEO David Rutkauskas. Here are the reports I pulled on him. It may be hard stuff for you to interpret but if you look at it long enough you can pick out the pieces of info you are interested in. The first two should pull up web-based links to the reports I ran on him individually and his business. The third is a word document that I pasted some info into that I found on various sites and the pdf is the list of creditors from his 2006 Chapter 7 personal bankruptcy. (It has since been closed.) I didn’t see any evidence of criminal activity and there was one lawsuit listed by Cannon copiers. Basically he doesn’t have a lot of assets and doesn’t appear to have any connection with franchising so it makes no sense that he started this crusade. He’s a self-employed father of four who lives in Pennsylvania. The business is supposedly marketing or consulting of some type but like I said, I see very little evidence that it’s an active business. Some of the information contained startlingly personal details, such as the names of my in-laws and their ages, and personal information about my neighbors. 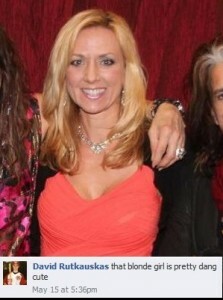 She stated I don’t “appear to have any connection with franchising.” I have 25 years of experience in franchising as VP of an international franchise consulting firm, Director of Marketing for an international franchise company, President of a franchise marketing firm, writer for national franchise magazine, and an expert witness in franchise cases. Ziva Branstetter’s email to David Rutkauskas is date and time-stamped May 8, 2013 11:34:06 AM CDT. Within hours, David Rutkauskas posted the content of the reports in a barrage of insulting and disparaging tweets over several days to his alleged 500,000+ twitter followers. The tweets included my home address, pictures of my house, a reference to my “4” kids, references to my 2007 bankruptcy, and other attempts to intimidate and embarrass me. 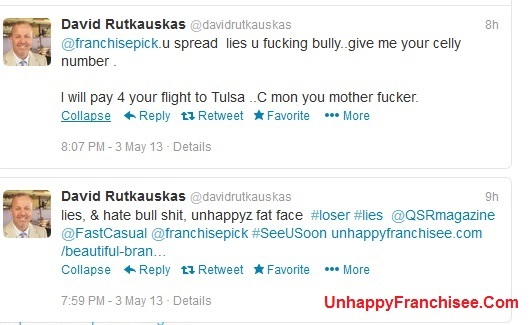 A warning: David Rutkauskas’ tweets contain profanity, vulgar references, homophobic and racist remarks. Ziva Branstetter has not denied that she sent a man on an alcohol and anger-fueled vendetta the personal information about the family and location of the man who was the target of his rage. Ziva Branstetter has ignored my requests for an apology or explanation. 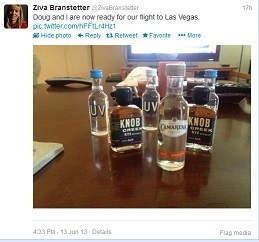 In fact, just hours after she ignored an email I wrote to her [ZivaGate: Letter to Ziva Branstetter], a Twitter request for an apology, and emails and phone calls from writer Holly Wall, Ziva Branstetter tweeted that she was off to Vegas with her husband. She tweeted a picture of the 6 bottles of liquor [pictured, left]she was taking on the trip – apparently a message that she and Tulsa World don’t answer to anyone. Ziva Branstetter has refused requests from two other publications for comment, citing that Tulsa World/BH Media policy forbids her from answering questions about the issue. Apparently, Tulsa World/BH Media policy is OK with their senior editors using company resources for personal vendettas – as long as they don’t comment or act like they give a damn once they get caught. ARE YOU FAMILIAR WITH ZIVA BRANSTETTER, TULSA WORLD, DAVID RUTKAUSKAS, OR BBI? WHAT DO YOU THINK OF THIS? SHARE A COMMENT BELOW. A paper prints an alleged defamatory comment, and then uses their internal resources to dig up dirt on the poster. Why wouldn’t they just delete the comment? Sean, sounds like this is another John Hewitt Nazi type. Good luck and you can certainly see the bias inherent in the news media! I’ve had a pretty adversarial relationship with Tulsa World. I admonished them for printing BBI’s press releases and propaganda verbatim for years, then pressured them into writing a realistic article on BBI. Even though I provided the bulk of the source material for their story, they didn’t credit or mention the site. I had to subscribe, but did so to leave some innocuous comments as UnhappyFranchisee for the main purpose of linking to my site. BBI sued “John Doe” and subpoened Tulsa World for my identity. Tulsa World’s attorney said they’d defend my identity with one stock letter, but if pressed they’d divulge my identity – even though my comments were not even REMOTELY defamatory. After I was forced into divulging my identity, they refiled the suit against me using my name. The suit is very vague, and doesn’t indicate which statements I made that they consider defamatory, and doesn’t say what business dealings I interfered with. I now wonder if Tulsa World was colluding with BBI in order to help set me up for the lawsuit – using my subscriber info as leverage. Then I find out that their lead investigative editor was digging up personal dirt for Rutkauskas to further use against me. I’ve been told Tulsa is a town that runs on cronyism. Too bad they didn’t consider all the Tulsa franchisees and “partner brands” that lost money to Rutkauskas and BBI to be their cronies. I expected bias, but the extent of the collusion really took me by surprise. Once the case against John Doe was filed and the subpoena was issued to the Tulsa World, they couldn’t delete the comment. Once the subpoena was issued, they had no intention of supporting the First Amendment right to post anonymous comments. I have no doubt Rutkauskas already knew Sean’s identity. We decided to call his bluff by making a preemptive strike and publicly disclosing his identity. It was not economical to fight the subpoena because, regardless of the outcome, this guy was going to sue anyway. 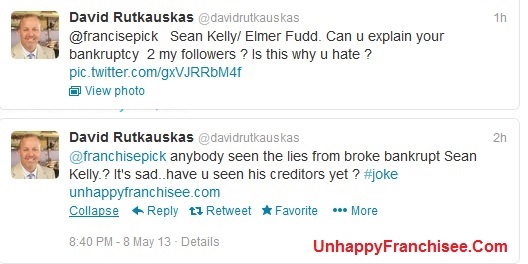 Rutkauskas is totally irrational and is blaming Sean for the failure of his company. He’s either not listening to his lawyer or he’s getting bad advice. For Rutkauskas, nothing good comes out of this case. Sean’s information is completely accurate and supported by more than one source. As far as the Tulsa World, the owner needs to go in and clean house, at least in the area of business reporting. Ziva-Gate is just the latest in a string of embarrassing situations. Their credibility has been severely compromised. So Sean Kelly is finally getting a little of what he has no problem giving? Seems fair to me, so far Sean Kelly and his co-hart Jonathan Fortman are simply having their respective tables turned on them… Got some breaking news, more lawsuits facing Sean Kelly, unhappy franchisee.com and others coming out of Mid-West State sooner vs. later…..
Not so fast: Last I checked, neither Sean Kelly nor myself have ever defrauded people out of money. Any franchisor who feels the need to use litigation as a means to silence critics and unhappy franchisees is doomed to fail. A legitimate franchisor would never approach criticism in that manner. Sean Kelly is a man of integrity and is providing a service which should be embraced by all legitimate franchisors. The web and sites such as this have made it much more difficult for unscrupulous franchisors to perpetuate fraudulent systems. No longer can franchisees be isolated from each other. Just ask the former franchisees of Stratus Building Solutions and Contours Express. They’ll line up to sing the praises of sites such as this. Keep this in mind, Not So Fast, unlike the con men exposed by Sean Kelly, we are motivated by principal, not by money. Frankly, I’m sick and tired of talking to franchisees every single day who have had their dreams destroyed and their life savings stolen from them by con men. This is an open discussion site. It’s our goal to provide both sides of every discussion the opportunity to present their views and let readers make up their own minds. We have a standing policy to provide anyone who believes that they have had untruths or inaccuracies posted about either them or their company the unlimited opportunity to provide corrections, clarifications and/or rebuttals. You can provide those corrections, clarifications or rebuttals either directly by posting a comment, or by emailing them to UnhappyFranchisee[at]gmail.com for publication. Truth is an absolute defense to any charge of defamation. If something untrue has been stated about you or your company, please provide a correction immediately so that the falsehood does not go unchallenged or uncorrected for any longer than necessary. If your objection isn’t to an untruth but to an opinion with which you disagree, speak your mind and persuade our readers why you’re right. If you feel that you’ve been defamed, here is your chance to set the record straight. Speak now, as they say, or forever hold your peace. It’ll be hard to explain in court why you didn’t correct the untruths about you when offered the chance, don’t you think?